Recipe below: how to make Indian pani puri filling, golgappa gol gappe ka pani shots. 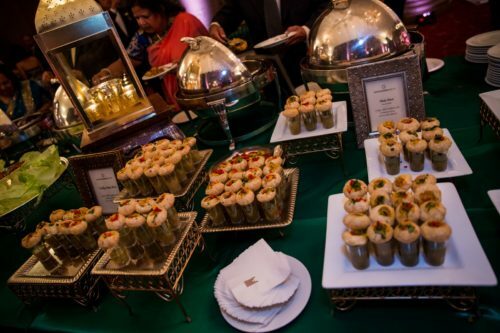 What are pani puri shots? 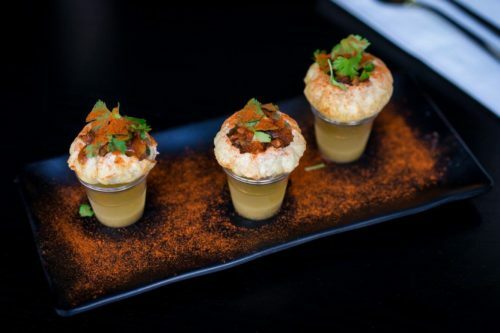 Pani puri shots (a.k.a. 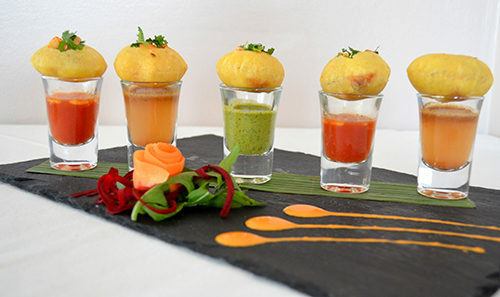 golgappa shots or gol gappe shots) are a versatile snack invented in India made of stuffed pani puri (golgappa) placed on top of liquid-filled shot glasses. These shots are usually served as eye-catching savory appetizers commonly seen at Indian weddings and banquets, but are sometimes made into a sweet dessert. 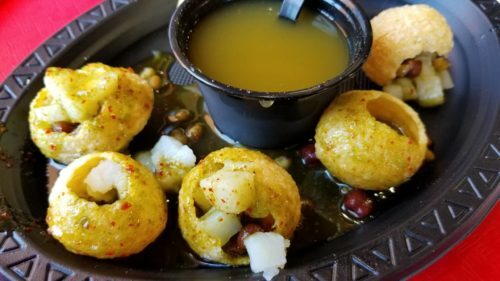 The one consistent component of this food is pani puri, a popular street food throughout India created by deep frying wheat flour into crispy puffed balls. The pani puris are punctured to create small vessels that hold an assortment of ingredients like diced vegetables, fresh fruits or even chocolate-covered nuts. Once filled, they are placed on shot glasses that are filled with complimentary ingredients (e.g. flavored water, juice vodka, etc.). 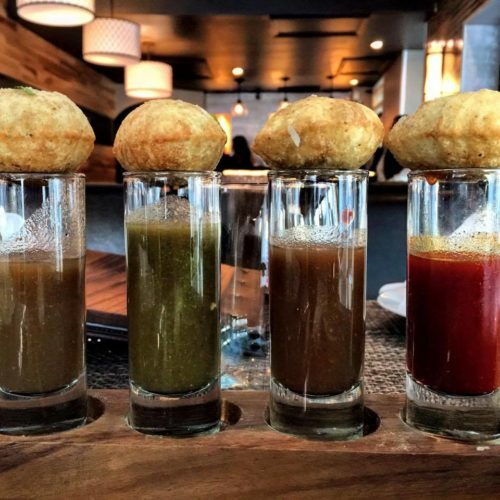 How do you take a pani puri shot properly? It’s pretty easy. 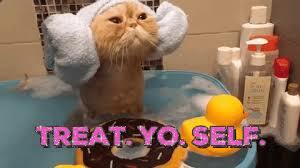 As long as you don’t stuff your face with everything at once, you’ll be fine. Ideally, you should pick up the filled puri, pour some of the liquid from the shot inside the hole of the puri and eat it whole, or carefully take a bite if it doesn’t fit in your mouth. Then, drink the rest of the shot. There you go. Now you’re a pro. Unless you visit India, chances are it will be a bit challenging to find these flavorful shots. So, you’ll have a much better chance at trying them if you make them yourself following the recipe below. However, if you live in an area with many Indian restaurants, you could be in luck. These restaurants with a modern take on Indian cuisine may serve this uncommon (outside of India) food. 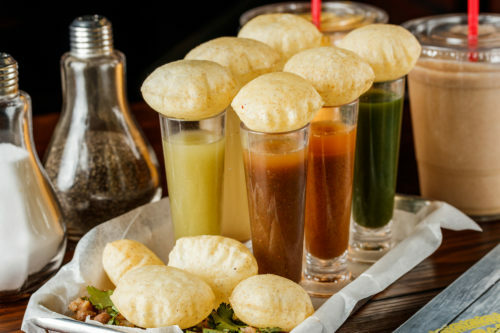 Here are some of the best places you can taste these pani puri shots. How can I make it? If you’re not near any restaurants or eateries that serve pani puri shots, you can still make them by following this recipe with savory and sweet options. First, put a few drops of cooking oil to lightly coat the pani puris. Place them in a single layer in the air fryer for 2 minutes, or until puffed up and crispy. Allow to cool for 1 minute. Gently puncture each of the fried puris with a small knife or your finger to create a hole large enough to place the filling. Mix the potatoes, chickpeas, coriander chutney and 1 teaspoon tamarind chutney. Add salt and pepper to taste. Place the mix in each of the punctured puris until filled. Combine the dates, jaggery, cumin, chaat masala and water. Mix well. Pour in the shot glasses and add a bit of boondi leaving enough room for the pani puris to sit on top without getting wet. Carefully coat the punctured puris in the melted chocolate and add sprinkles. Chill the chocolate-covered pani puris in the refrigerator for 30 minutes, or until solid. Fill the chocolate pani puris with the chopped nuts. Pour the blended ice cream in the shot glasses and add a bit of chopped chocolate, leaving enough room for the pani puris to sit on top without getting wet. Place the filled pani puris on top of the filled shot glasses. Remember, there are an infinite number of ways to make pani puri shots, so substitute ingredients as you like (besides the pani puri/golgappa) and be creative. Have fun!